I pull up the driveway. The sunny yellow house seems to smile coyly, peeking from behind a canopy of trees. A small olive valise, held closed with a green bungee cord, sits in front of the steps, like a passenger waiting for a bus. It looks as happy as the house. I am its ride. I am here to pick up the suitcase and my friend Joan to indeed take them to a bus stop, where she will catch a ride to New York. I walk passed the suitcase into the house where four fawn pugs make a pile in the wooden box by the stove. Our friend Norma is there to housesit. The cool, dark room offers reprieve from the sun, but it is no less happy inside than out. Gryffindoor, Joan’s youngest pug at almost a year, appears at the top of the stairs, whimpering because he knows I am here and he wants to see me, but he has not yet learned how to make it down the steps. I peer around the doorway and look up the darkened stairwell to see his black form silhouetted against the light from the Florida Room. Joan is uncharacteristically on time. She pops out of the bathroom, sporting her cheerful orange tank with peek-a-boo cutout above the chest and crisp white jeans with shades of orange cuffs. She breezes about the room as Norma chatters and I laugh, the mood festive. Sometimes Joan gets frazzled before a trip, but she is relaxed today. She grabs her overnight bag and heads for the door as I promise to call Norma when Joan boards the bus. 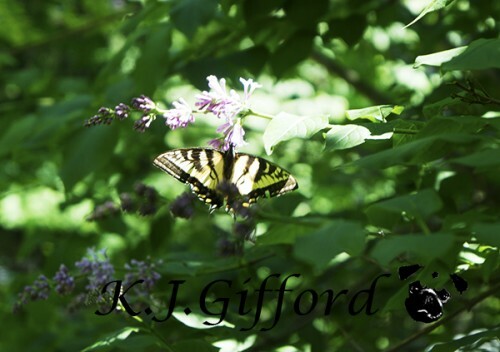 We go outside and I stop to chase a butterfly to nab its picture. Standing on the slate wall, I grab a shot. Norma offers a hand to help me down. I skip passed the suitcase, grabbing the handle and pulling it behind me to the car. 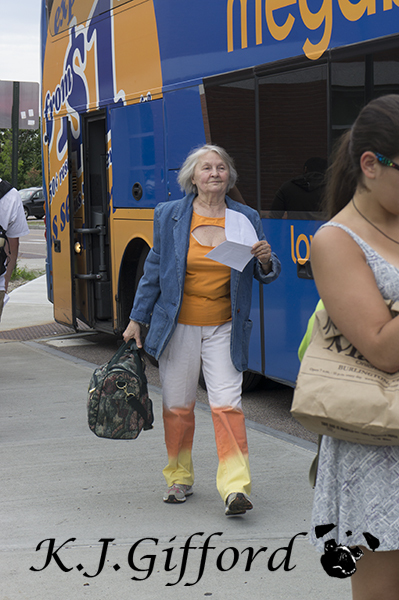 We make the drive to Burlington, to the UVM campus, where Joan will catch the Megabus, talking all the way. The day is bright both inside and out. Other passengers approach and the woman moves to talk with them. I delight in watching Joan. As a concert pianist she has traveled the world many times over and yet she turns to me with childlike glee announcing that the bus is supposed to be a double-decker. “Should I try up top?” she asks with an eager smile. When it finally pulls up, I note that the blue bus with golden orange lettering matches Joan’s own ensemble, now topped with jean jacket. “Did you plan it that way?” I ask. She smiles, practically prancing to the rear of the bus to load her suitcase. She reminds me of my five-year-old niece Tori, cheerful, childish energy wrapped in a charming shell. Their eyes twinkle the same way. Joan hops on the bus, choosing the lower level after all and I watch as she makes her way to the back. “I feel like I’m seeing my kid off,” I shout as she drifts out of sight. I catch a glimpse again as she sits down, pressing her face against the glass and making a funny face. I wave goodbye to my friend, a smile plastered to my face. I know why I like this lady so -- she retains her sense of wonder. I hope I remain that young. I hope every trip always seems brand new. I stand in the shadow cast by her and the bus, realizing such glee is infectious. It draws me back to the sunny yellow house and its occupants again and again.